One Mum, from 179 waiting for answers from the Chilcot Report/Iraq Inquiry. Finally! Finally, after seven years of waiting, the Iraq Inquiry is going to be published tomorrow, Wednesday the 6th of July! Its purpose was to look into why Britain went to war, so maybe now we’ll get some answers. I am the mother of one of the 179 service people who died during the conflict which lasted from 2003 to 2009, and I will be sitting in the balcony on Wednesday, wearing a t-shirt printed with a picture of my son’s face, as Chilcot releases his report. Many of the families who lost their loved ones will also be there, bearing witness and hoping for the truth. 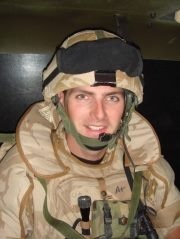 My son, Senior Aircraftsman (SAC) Christopher Dunsmore, died in a rocket attack on Basra Airport on the 19th July 2007. Two fellow servicemen also died in this incident, which impacted on so many people – family, friends, colleagues in the RAF Regiment and in Chris’s full time civilian job with Metacoat – as every event of this type is bound to do. In order to come to terms with my grief I started writing. I now have a Masters in English and Creative Writing, and belong to Ruler’s Wit, a post-graduate writing group. Our third anthology, SummerTales, is available from Amazon, in paperback and Kindle formats. Here is an extract from one of my stories Little Cuts of Film, a ‘factional’ account of what happened to Chris through a friend’s eyes. It draws on the real accounts of six people Chris knew, his letters and his diary. The watery sun makes streaks of orange and pink in the slatey blue sky as it begins to dip below the uncluttered horizon. Against the brightness of the sunset, and the unremitting greys of the runway and the squat airport buildings, two shadowy shapes kneel to guide the closing of the twin flaps at the rear of the C130 Hurricane. The wailing sound of the pipers’ bagpipes dies away as the four coffins we’d just carried in are swallowed into the belly of the plane. A tear escapes from my left eye as the buglers play the last post, one either side of the huge door. At least one lad in my line had lifted his cuff to his face discreetly during the service, but I’m determined to stand firm. The whole squadron is watching; A Flight, B Flight, C Flight, Support Weapons and the Boss, with the Engineers and Admin people. Something like a hundred and fifty of us. Well, not quite that many now. Our fellow Oggies are on their final journey home, away from this relentless heat, the dust, the lines of the camp, the flat of the land and the fatigue. We’d never been so tired. So gutted. So proud. "Parade dismiss!" We turn forty-five degrees together in the lines where we had been standing to attention, and watch as the plane takes off into the sun, waggling its wings in a final goodbye. "Lads, lads, we did our best." I tell them silently. We’d spent hours every one of the last three sweltering July days practicing. The drills involved in lifting the coffins, walking with them, turning, and setting them on trestles after our normal patrols. Everything had to be perfectly timed so that all four coffins moved together. Somehow it was, even though the sight of the Union Jacks had closed my throat. I shut my eyes for a moment before walking away. I can see the chaplain, dressed in his sandy-coloured battle dress like we all were, his purple mantle draped over his shoulders. His last words run through my mind. I’m gonna remember them forever. The bit about forgiving their sins was crap. They didn’t have any to forgive and who by, anyway? I don’t hold with all the God stuff normally, but we need the ritual of giving respect. We need to feel we’ve done what we can for our brothers-in-arms. That is true.